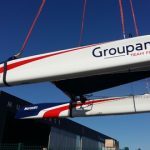 At 9.30 thrusday morning, the Groupama team France training boat, in preparation for the 35th America’s Cup, was launched. 6 months were required for the French ansd Swiss divisions of the Carboman Group to combine all the elements needed in this concentration of technology. The rules set by the US defender, Team Oracle, do not permit navigation on the Coupe Class AC+ (AC50) more than 150 days before the competition and allow only one boat to be built. It was quickly apparent to the challengers that a solution was imperative in order to optimise their training time. The construction of the training boat, the Class AC Test, with the same beams and rig of the Coupe Class AC+ but with the hulls from the Class AC45, allowed them to circumnavigate this rule. The launch of this catamaran will allow Franck Cammas and his team to start training immediately in very similar conditions to those which they will encounter on the Coupe Class AC +. The real raceboat won’t leave the boatyard until the end of the year to take part in the competition in Bermuda in June 2017. During construction, the perfect collaboration between the Carboman Group entities and the Groupama Team France was a major advantage in driving this project. The beams and the central pod were built in Switzerland at the Décision boatyard whilst the hulls, the platform assembly and the 3 aft wing flaps were undertaken by the Multiplast team. Team Groupama France, under the technical guidance of Horacio Carabelli, was in charge of doing the system fit-out, the deck gear fit-out and the painwork. Aluminium honeycomb thermoforming, skin bonding on extra thin glue film, and the use of TPT (Thin Ply Technology), are just some of the unique qualities of such a build. “The implementation of TPT technology on the Multiplast plotter allowed the Head of Design at Groupama, Martin Fisher and his team to optimise the areal weight and the orientation of the carbon plies during lay up in the aft wing flaps. Specially, we have lightened the flaps, which is quite signicant for the pieces when the centre of gravity is 15m high”, affirmed Yann Penfronis. 25000 hours of work will be necessary between the 4th of January and the 7th of July to build the first platform. In parallel with the Class AC+ construction, the Coupe Class AC+ hulls are already under construction at Décision S.A.; They will be delivered to Multiplast in November for the launch at the end of the year.